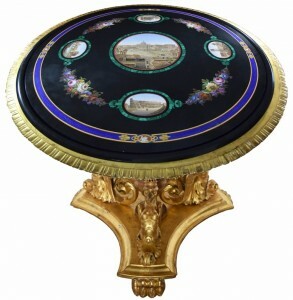 A large and beautiful micromosaic table made in Rome, Italy around 1850 – circular in shape and made from black marble, with the top inlaid with semi-precious stones – is the expected headliner at the inaugural sale of AuctionLife Florida, set for Saturday, July 24th, in the Ramada Boca Raton hotel at 701 Northwest 53rd Street in Boca Raton, Florida, beginning at 1 pm Eastern time. Tarek Jabaly is the owner and auctioneer of AuctionLife Florida (www.AuctionLifeFlorida.com). He has 10-plus years' of auction experience in the South Florida area, in various capacities. The table carries a pre-sale estimate of $25,000-$45,000 and depicts St. Peter’s Square in the center and four Roman sites interconnected by floral festoons, a motif popularized by the artist Cavalier Barberi, who began using it around 1840. Each scene is bordered with what appears to be coral, then malachite, with the whole surrounded by a band of micromosaic lapis lazuli. The table's estimate may seem robust at first, but it actually might be conservative, considering an accompanying valuation from the International Society of Appraisers states it is worth $200,000. That's “fare well” as in all three had a good week last week at auction, and “farewell” as in all are recently departed musical icons (Whitney not as recent, but just as dearly missed). On June 25th in Beverly Hills, California, Heritage Auctions held an Entertainment & Music Memorabilia Auction that featured items from all three stars. By far the top-selling lot from the group was Prince's personally-owned and played Yellow Cloud electric guitar. It went for $137,500. Also, a reel-to-reel demo tape from 1976-77, with a track list written in Prince's own hand, brought $4,250. 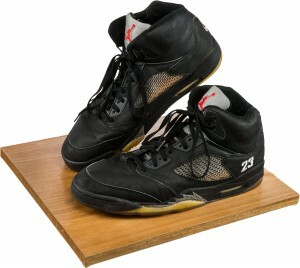 Whitney Houston's pair of Nike Air Jordan sneakers gifted to her by basketball great and close friend Michael Jordan (shown), circa 1990, realized $20,000; while her stage-worn Dolce & Gabbana multi-colored fur coat climbed to $16,250. A small snippet of David Bowie's pale blond hair, clipped in 1983 by Wendy Farrier, a wig mistress at Madame Tussuad's in London, who needed it as a color match for Bowie's wax museum wig, fetched $18,750. Also sold was a blood-stained shirt worn by a Dakota Hotel employee who tended to John Lennon the night he was shot ($42,500). 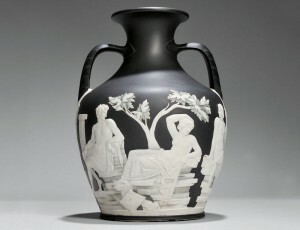 Company records show that between 1791-1796, Wedgwood fired 43 “first edition” Portland vases. Eleven of these broke during the process. The numbers of additional faulty vases are unknown. It's generally believed that somewhere around 30 of these black jasper vases were of first quality. Most, if not all, of these remaining vases bear a number inside the rim inscribed with manganese pencil. Now, one of these exceedingly rare examples of the Portland vase is about to be sold at auction, through Skinner's, in their Marlborough, Mass., gallery. (www.skinnerinc.com). The auction date is July 15th, with a start time of 10 am Eastern time. The vase is the expected top lot of the sale, with a pre-sale estimate of $40,000-$60,000. It will be from Part I of the Paul Lauer collection of Wedgwood. Mr. Lauer purchased the number 22 first edition Portland vase at Sotheby & Company in London, back on Nov. 30, 1971. The Skinner sale will also feature an expansive selection of fine silver and European fine decorative arts of the 16th-20th centuries. Included will be Part II of the Troy Dawson Chappell collection of 17th & 18th century English pottery. The catcher's helmet with the letters “NYPD” emblazoned on it, worn by New York Mets' catcher Mike Piazza in a game played on Sept. 21, 2001 (the first sporting event held in New York City following the 9/11 attacks), is for sale. The helmet is one of 100 lots expected to bring $10,000 or more by Goldin Auctions. The auction goes online July 11th (at www.GoldinAuctions.com) and will end on August 4th at the National Sports Collectors Convention in Atlantic City, N.J. 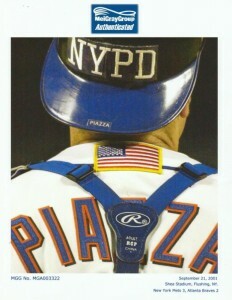 In May, Goldin Auctions sold the jersey that Piazza wore in that same game for $365,000. The game marked the first time a player was allowed to wear a hat or a helmet that was not associated with his respective team. Piazza wore it the entire game, and was the contest's hero when he hit a home run off Atlanta Braves relief pitcher Steve Karsay in the bottom of the eighth inning. Prior to that, the Mets were trailing, 2-1, but with the help of Piazza's blast the Mets went on to win the game. The helmet comes with a letter of authenticity from The MeiGray Group. Goldin plans to donate 50 percent of the buyer's premium to the Tuesday's Children charity. Own your very own copy of the 1776 Declaration! 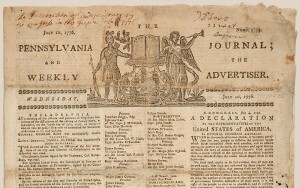 Well, not the actual Declaration of Independence, but the next best thing: a rare early printing of the document that appeared in William Bradford's The Pennsylvania Journal and Weekly Advertiser, dated July 10, 1776 – just six days after the country declared its freedom from England. The rare and highly collectible treasure will be offered sometime this fall (date and time to be announced) by Doyle Auctioneers & Appraisers in New York City. It is one of the earliest printings of the Declaration in any form. The other eight known examples are held by institutions. William Bradford (1719-1791) was a printer and soldier, as well as the grandson of William Bradford, the English Separatist who arrived in America aboard the Mayflower in 1620. The younger Bradford was born in New York City but lived mostly in Philadelphia, where he ran The Pennsylvania Journal from 1742 up until his death. Each issue of the paper had the still-recognized image of a snake chopped into segments with the motto “Unite or Die” (later adopted by Paul Revere, Benjamin Franklin and others). Bradford was a prominent figure in the American Revolution.